Dads Army. Still a favourite. Capt Mannering = my dear departed dad. Does anyone remember any of these? There was a programme on Channel 4 called Wanted. It basically involved teams roaming around the country and trying not to get caught. For the live episode they'd hide in telephone boxes and hope the person tracking them wouldn't catch them. It was like an early version of their Hunted thing, only a lot less fake! Lost. No, not that one! This was a Channel 4 programme that involved teams being dropped into the middle of an unknown country and they'd have to make their way back to the UK. The first team back won...something. Crisis Command. I absolutely loved this! Members of the public would play government ministers and would have to react in real time to a crisis that was unfolding somewhere in the country. Experts then dissected whether the decisions they made had resulted in the fewest casualties. Never heard of them Kranek. The only similar prog I can think of is one that Anika Rice used to do. Running around the country raising money for a good cause. But all I can really remember is the cameraman filming her arse all the time. Lady Murasaki wrote: Never heard of them Kranek. The Phil Silvers Show...very good. I had every episode of Bilko on DVD - but now I don't have a DVD player. I don't recall the Andy Griffith Show. One or two of the actors in Bilko went on to Car 54, Where Are You? I think. jp761 wrote: Your favourite TV shows from the past.. Those that ended some time ago. This was sorted out by the Production Team hiring an officer from London Fire Brigade as advisor, so many of the stories were then based on true life current incidents within the Brigade/"Fire" Magazine, and other Brigades. We found the only way to find out Politics/changes, re structuring etc within our Brigade was to watch the show, one learned more from the TV Series than being on the "shop" floor. He was a veteran actor but never starred in "Casualty "
Chicago Fire seems authentic with its story lines IMO is very good.some stories cross over with Chicago PD, Chicago Med, and Chicago Justice but one has to catch them in the right sequence or the storyline gets confusing. Ah, thanks for the info. Not sure who I'm thinking about in Casualty, he looks very similar to someone, so I thought. Mind you I've never been an avid watcher of Casualty, just an episode here and there over the years. Yeah Chicago Fire is good, quite surprising how they've ran season 5 and 6 back-to-back. Yes, from time to time the Americans love doing a bit of series cross over, and yeah at times you do have to make sure you watch everything in the correct sequence. As I mentioned in the "London`s Burning" Post the series changed policies within the Fire Service and helped to modernise other UK Fire Brigades. 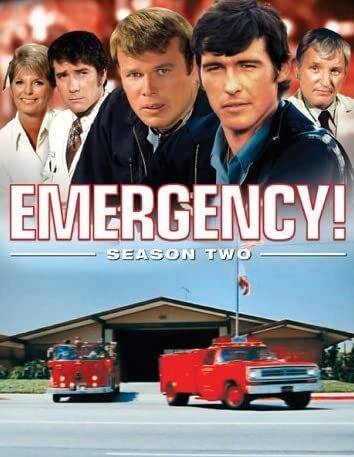 But the biggest impact a TV Series has had world Wide was the late 1970`s/early 80`s series " Emergency "
Where I was stationed a number of Doctors realised the scheme would save lives and helped by public funding were able to purchase specialist medical equipment, Defibrillators, drugs etc and were equipped with a pager unit, so in their own free time were called out to serious incidents to administer medical treatment during rescue operations. It goes to show the power of a TV Drama Series, it has helped to save hundreds of thousands of lives world wide. Londons burning has been on Drama Channel since last september i think it's coming up to series 9,Bayleaf is due to leave very soon to work in his restaurant. Cheers. I'll look out for it. Might watch one or two episodes for old times' sake. Lie To Me is sorely missed.